Year 1 is a fun and exciting year group! We enter Year 1 as happy, confident leaners. Our teachers help us enter this new Key Stage by carrying on with some of the routines we had in Reception Class. We learn about how we can become more independent and think carefully about our own learning. Throughout the year, we learn skills in the Foundation subjects through our topics, for example 'Houses and Homes' and 'Caring for Others and our World'. Topic lessons teach us about History, Geography, Art, DT, Music and Computing. Science is taught each week, as is PE and RE. Daily Maths and English sessions follow the new National Curriculum. Each day, we have Phonics or Guided Reading sessions where we learn how to read in lively, interactive ways. We love learning to read, and enjoy taking home reading books from our classroom and our school library. 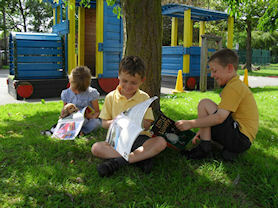 We really enjoy learning outside the classroom and we use our outdoor areas as often as we can. Our teachers plan events and trips throughout the year to enrich our topics and make our learning fun! We love taking part in different lunch-time and after-school clubs. Infant Choir, Tennis Club and Running Club are just a few of the things we can do. We elect members of our class to join School Council this year, who meet each week to talk about ways to improve our school. We love coming to school and impress our teachers with all of our hard word. Year 2 is a very lively and energetic year group, who set the example for our Key Stage. We take pride in being the oldest children on the playground and show excellent behaviour at playtimes and lunchtimes. This year, we take on more responsibilities in school and get the chance to show our teachers just how independent we can be. This year, we will continue to follow the old National Curriculum as we are going to be assessed on this by our teachers. Year 2 is a SATs year, which means our teacher gives us levels in Reading, Writing, Maths and Science at the end of the year. Although it is a busy year, we still have lots of fun and learn about lots of different things! Year 2 is the first year we go swimming. For a term, our teacher takes us to a local swimming baths to learn how to swim and perfect our strokes! This is a very exciting time, as is the coach journey there and back! As in Year 1, we continue to have daily Maths, English and Phonics/Guided Reading sessions, as well as learn our Foundation Subjects through exciting termly topics, such as 'Inventors and Explorers' and 'Rainforests'. 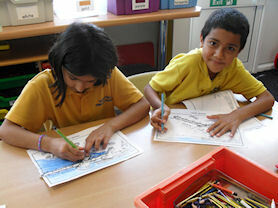 We leave this Key Stage as happy, independent learners who are ready to face the challenges of Key Stage 2. 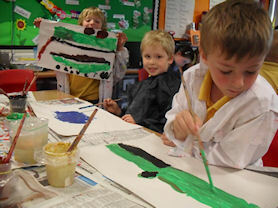 Enjoying an Art lesson in Year 1. 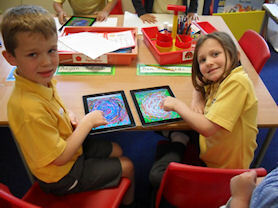 We regularly use our iPads to extend and support our learning. 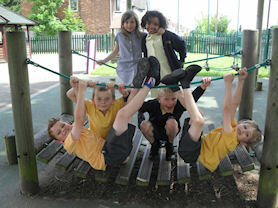 Our Key Stage 1 adventure climbing frame is enjoyed by all of the Infants. We work very hard in Year 2. We love learning through topics and take pride in our work. We are super readers! We enjoy reading a range of books both in and out of school.